SAP Profit Center Basic Structure deals lot of aspects and this post is continuation to the previous one. General/Plant Data view, you enter the profit center in the General plant parameters of this view. If this view is not relevant for this material (for example, with raw materials), you maintain the profit center in the Storage 2 view, also in the General plant parameters. However, it is always the same Profit Center which is shown in different views. A production order contains its assignment to a profit center in the order master record. For PP production orders or process orders, you can find the profit center in the Allocation tab. 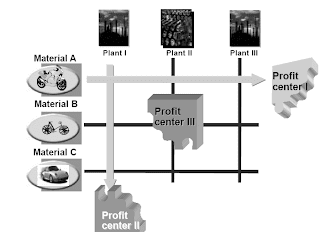 For CO production orders, the profit center is located on the initial screen.When you create a production order, the default profit center is taken from the master record (general plant parameters) of the material being produced. 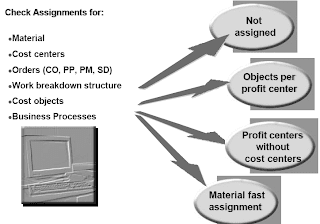 For process orders, the system proposes the profit center for the main product in the order. You therefore usually do not need to enter the profit center manually. In sales orders , each order item is assigned separately to a profit center. You can find the profit center under the menu option Edit-> Item -> Account assignment. The default profit center is taken from the material being sold. You therefore usually do not need to enter a profit center manually. Defaulting the profit center in a sales order item from the material master plant data assumes a product-oriented division of profit centers (based on the material), a geographical division (based on the plant), or a combination of both.If you wish to structure your company from a sales-oriented rather than a production-oriented view,you can also determine a profit center from the available fields in the sales order header or item with the help of substitution rules. If the system finds a valid substitution for a sales order, it uses this instead of the default found using the assignment on the material master record. The assignment monitor provides you with an overview of all the assignments you have made to profit centers and supports you when you make or change assignments. For example, you can call up a list of cost centers which have not been assigned to a profit center or those cost centers which are assigned to a particular profit center or profit center group. When you display the list online, you can jump from there directly to the transaction for changing the object. That way you can make any missing assignments or correct any incorrect ones. 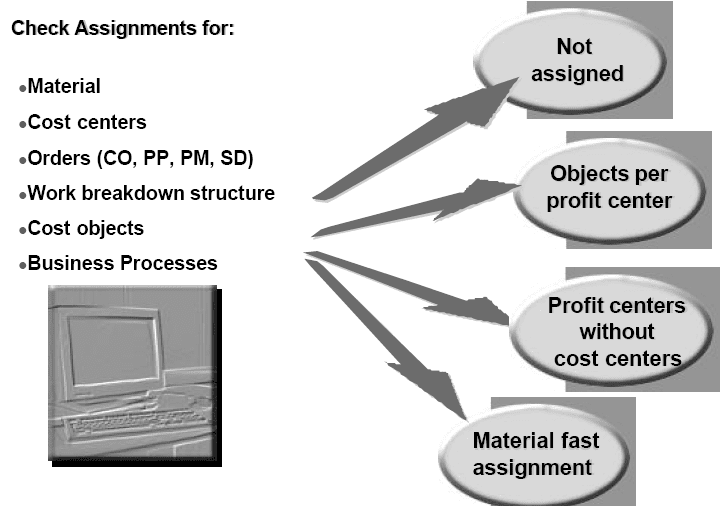 The menu Material also contains the option Fast assignment, which lets you assign a large number of materials to a profit center quickly.The menu Orders lets you analyze the following types of order: internal orders (CO), imputed cost orders (CO), CO production orders, PPS production orders, process orders, network headers and maintenance orders.The menu Cost objects contains the general cost objects as well as the cost objects for process manufacturing. Incorrect assignments lead to incorrect transaction data in Profit Center Accounting, which usually can only be corrected with great difficulty. You should therefore check your assignments very carefully.